ERITECH Chemical Ground Electrode System provide a low-impedance ground in locations of high soil resistivity. 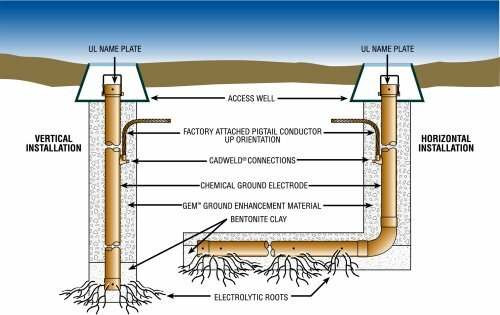 Together with GEM as backfill, the system dissipates lightning energy and other dangerous electrical fault currents, even in sandy or rocky soil conditions. The Chemical Ground Electrode system is ideal for locations of high soil resistivity. Chemical ground rod electrodes can be ordered as individual components or as a complete kit. Kits include the chemical ground rod electrode (pre-filled at the factory with electrolytic salts), bentonite and GEM backfills, and an access well. To order the chemical ground rod electrode only, add (B) to the end of the part number.